Duparquet Copper Cookware Solid Copper Butter Pan with Silver Lining, 3.25"Dia. Duparquet Copper CookwareSolid Copper Butter Pan with Silver Lining, 3.25"Dia. 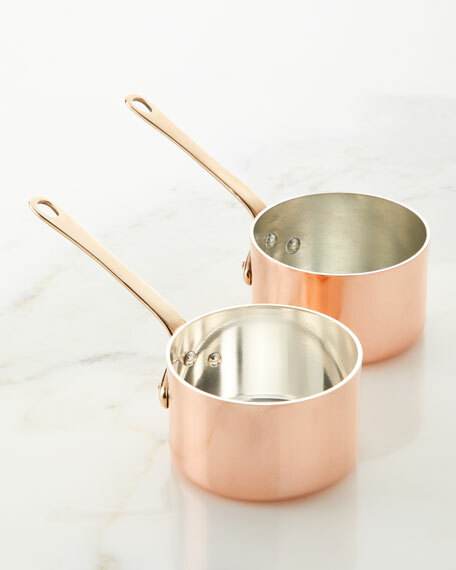 Silver-lined copper pans are the ultimate technical cooking tools. Silver is a great conductor of heat - much better than tin - and even BETTER than copper. This translates to a supremely even-heated cooking surface offering superb temperature control. Handcrafted and American-made butter pan. These silver-lined pans are individually made to order. Each piece is hand-crafted specifically as a silver-lined pan. After the pan is assembled, both the exterior AND interior are polished. This polished cooking surface is then lined with silver to a near mirror finish. Solid copper with silver lining and brass handle. Do not "preheat" your silver-lined pan. Since copper and silver conduct heat so well, the pan heats up very quickly. Have something in the pan before lighting the flame (oil, butter, etc.) This will absorb the heat and act as an "alarm" if you get distracted and forget about the pan on the burner. Use Medium heat max. Initially, use Medium heat as your maximum setting until you are comfortable using it. Cooking at higher temperatures will also encourage foods to stick to the lining. Avoid scrubbing/scouring. The silver-lining is a hard but thin lining and will wear away eventually. Also, it will scratch if using a scouring pad. If you have cooked on foods, instead of scouring, try filling the copper pan with water and a bit of dish soap then simmer for 15 minutes. You'll be amazed how easily the cooked-on food cleans up with just a sponge. Less elbow grease and less wear on the lining. Don't sear in your silver-lined pan. The silver lining can handle the temperatures of searing BUT the high temperatures will certainly make an unsightly mess of your gorgeous pan. To sear meats at high heat, choose a cast iron, aluminum, or stainless steel pan instead of choosing your copper cookware. Browning meats is fine - but searing tuna or searing steak should be done in a different pan. Use wooden/silicone utensils. Avoid scratching the silver cooking surface with metal utensils. Keep your copper clean and polished. Wash in hot water. Towel dry after washing to prevent water spots. You may use a copper polish of your choice on the exterior and a silver polish on the interior. DO NOT PUT YOUR COPPER PAN IN THE DISHWASHER (the chlorine in dishwasher soap will pit the copper surface). HAND WASH this lovely creation. Same cookware used in Neiman Marcus restaurants. Duparquet Copper Cookware Solid Copper Butter Pan with Tin Lining, 3.25"Dia. Duparquet Copper CookwareSolid Copper Butter Pan with Tin Lining, 3.25"Dia. Here in Rhode Island, we handcraft absolute best-in-class, heirloom quality copper cookware for clients ranging from the passionate home cook to the gourmet restaurants of Relais & Châteaux. Under one roof, we spin the copper, rivet the handles, tin-line the cooking surface, and finally polish the finished piece. Solid copper with tin lining and brass handle. Do not "preheat" your copper pan. Since copper conducts heat so well, it heats up very quickly. The tin lining can (and will) melt if left on a burner without anything in the pan. Have something in the pan before lighting the flame (oil, butter, etc.) This will absorb the heat and act as an "alarm" if you get distracted and forget about the pan on the burner. Use Medium/High heat max. Since copper heats quickly and evenly, use Med/High heat as your maximum setting. Avoid scrubbing. The tin lining is a very soft metal and will wear away eventually. 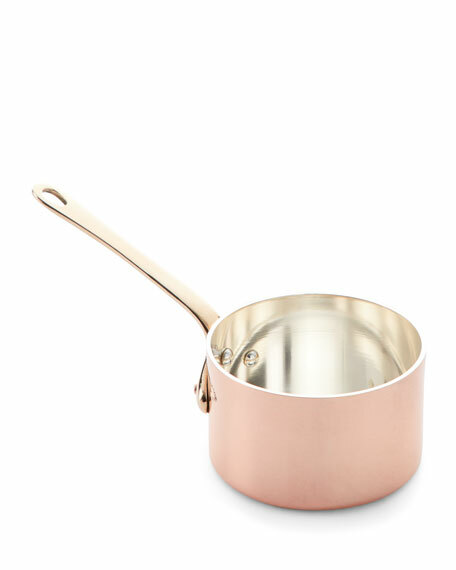 For cooked on foods, try filling the copper pan with water and a bit of dish soap then simmer for 15 minutes. You'll be amazed how easily the cooked-on food cleans up. Less elbow grease and less wear on the tin lining. Don't sear in your copper pan. Remember, the tin lining melts at only 450°F. To sear meats at high heat, choose a cast iron, aluminum, or stainless steel pan instead of choosing your copper cookware. Browning meats is fine - but searing tuna or steak should be done in a different pan. Use wooden/silicone utensils with tin-lined copper pots. Avoid scratching the tin cooking surface with metal utensils. 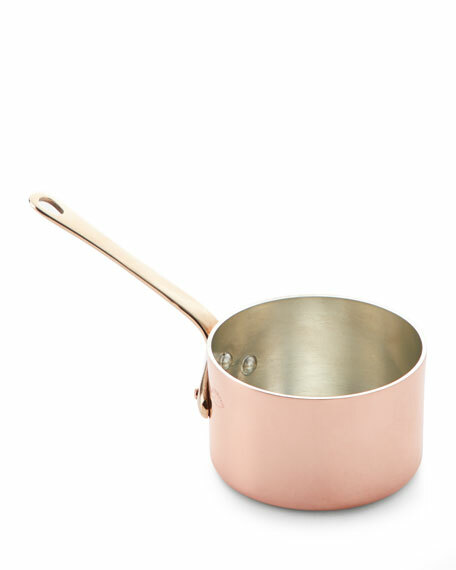 Keep your copper clean and polished for best cooking results. Wash in hot water. Towel dry after washing to prevent water spots. DO NOT PUT YOUR COPPER PAN IN THE DISHWASHER (the chlorine in dishwasher soap will pit the copper surface). Retinning. Eventually the tin lining will wear away. The rule of thumb is that a copper pan should be relined when the total area of copper showing on the cooking surface is about the size of a US quarter dollar.